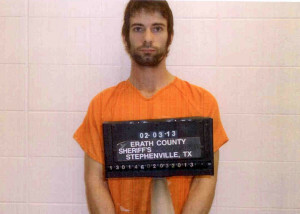 After six, long months of waiting, Eddie Ray Routh, 25, was indicted on one count of capital murder late Wednesday afternoon for the murder of Navy SEAL sniper Chris Kyle and friend, Chad Littlefield. Kyle and Littlefield were killed on Feb. 2, at Rough Creek Lodge in Glen Rose, Texas when Routh allegedly turned on them at the gun range, shooting them to death and then fleeing the scene in Kyle’s truck. Eddie Ray Routh, 25, was indicted on one count of capital murder late Wednesday afternoon. Routh’s mother told news reporters that her son suffered from post-traumatic stress disorder, and she had reached out to Kyle to help her son with his disorder. During the wait period for Routh’s indictment, he has been in the Erath County jail in solitary confinement and on suicide watch, and has been reported to have violent outbursts, including smashing a television and flooding his cell. After Kyle served four tours in Iraq as a Navy SEAL sniper, he began to give back to veterans by starting a company called Craft International and collaborating with FITCO Cares, a company to assist disabled veterans with physical and emotional rehabilitation. On Jan. 28th, just five days before his death, Kyle told Texan News Service in what is believed to be his last recorded interview that he wanted to be remembered as someone who stood up for what he believed in and someone who helped make a difference for veterans. “I would love for people to think of me as a guy who stood up for what he believed in and helped make a difference for veterans. You know, somebody who cared so much about them that he wanted them taken care of,” Kyle said. A series of hearings and a trial date will soon follow, although no schedule has been made at this time. K’Leigh Bedingfield is a senior Broadcast Journalism student from Clifton, Texas. She currently serves as the summer Editor-in-Chief for Texan News Service.